Richie Hawtin's ENTER. 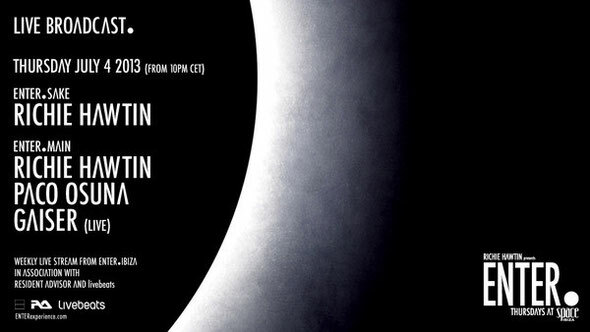 begins its 13 week residency at Space in Ibiza tonight with performances from artists including Richie Hawtin, Nina Kraviz, Paco Osuna, Photek, Tale of Us, Demdike Stare and Hot Since 82.This week also sees the release of the new ENTER.IBIZA 2013 CD to mark the start of Season 2. Featuring mixes from Paco Osuna, Hito, Barem and Mathew Hawtin, the four CD collection is designed to showcase the different sounds and moods from each room within ENTER..